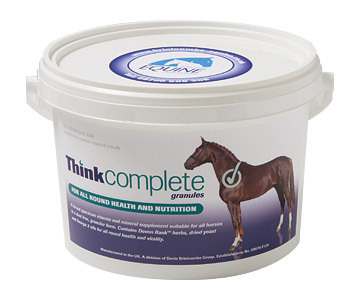 Brinicombe Equine Think Complete is a granular supplement which provides a combination of naturally sourced, inorganic and chelated minerals to maximise absorption from the gut and ensures the products will be fully utilised throughout the body. When fed the correct amount, Think Complete provides the horse with the optimal levels of minerals and vitamins to support health and performance in a dust free alternative to powder supplements. They are easily handled and can be mixed in with the horse's regular feed. There is no initial loading dose with this product. Mix with a damp feed, gradually building up to the required dosage over seven days. There are currently no questions for Brinicombe Equine Think Complete for Horses - be the first to ask one!